HELSINKI — OneSpace has completed assembly and testing of its OS-M rocket in preparation for a launch at the end of March which, if successful, would make it the first Chinese private rocket firm to reach orbit. Comprehensive tests on the OS-M1 solid propellant rocket began last week in Xi’an, north China, and the team is now preparing to transport the launch vehicle to the launch site in the northwest of the country, a OneSpace representative told SpaceNews. Consisting of three solid propellant stages and a liquid propellant fourth stage, the 19-meter-tall, 20 metric ton OS-M1 is capable of carrying a 205-kilogram payload to 300-kilometer low Earth orbit (LEO), and 73 kilograms to 800-kilometer sun-synchronous orbit (SSO), according to OneSpace. The company test-fired engines and performed stage separation tests during the second half of 2018 before comprehensive electrical systems, fairing separation and other tests early this year. The launch will take place at the Jiuquan Satellite Launch Center in the Gobi Desert late in March, with the timing to be confirmed following coordination with launch site authorities and the customer. While neither customer nor payload for the launch have been disclosed, ZeroG Lab, a Beijing-based developer of micro- and nanosatellites and components established in late 2016, earlier this week posted on its Sina Weibo microblogging account that its Lingque-1B technology verification satellite will be launched March 25 from Jiuquan. Though the launch vehicle was not stated, the announcement prompted Chinese aerospace watchers to suggest that this will be the payload for the OS-M1, which appears to be on schedule for launch in late March. ZeroG Lab is backed by Huaxun Fangzhou Technology Co., and last month also received investment from Yinxinggu Capital. ZeroG Lab plans to establish a remote sensing constellation named ‘Lingque’ which will consist of 132 6U CubeSats with a resolution better than 4 meters. A first tech demonstration satellite, Lingque-1A, was launched as a secondary payload on a Long March 11 rocket. OneSpace and fellow Chinese private rocket company iSpace both launched two suborbital rockets last year, including one each from Jiuquan, one of four national launch sites which are all run by the country’s military. Jiuquan has been opened to private launch companies as part of a national civil-military integration strategy, and will also host launches of the Kuaizhou commercial launcher series developed by giant state-owned enterprise CASIC. Beijing-based iSpace is also planning its first orbital launch with the Hyperbola-1, a 1.4-meter diameter, 20-meter long launcher which uses three solid stages and liquid fourth stage to enable it to deliver up to 150 kilograms of payload to a 700-kilometer-altitude SSO. Earlier indications suggest the launch could take place as soon as April. The company, also known as ‘Space Honor’ or Beijing Interstellar Glory Space Technology Ltd., early this month stating that it have performed a successful test of attitude control engines and had completed development of all the engines for the four-stage launch vehicle. Landspace, another company established following a 2014 government decision to open the launch and small satellite sectors to private capital, made the first private Chinese attempt to reach orbit last October, but the launch failed when the Zhuque-1 solid rocket suffered an issue with its third stage, with the payload for China Central Television (CCTV) falling into the Indian Ocean. Lan Tianyi, founder of Ultimate Blue Nebula Co., Ltd., a Beijing-based space consulting company, noted in an email to SpaceNews that the upcoming launches indicate that all three of the first wave of private Chinese launch companies will make it to the launchpad, indicating strong overall capabilities in the emerging launch sector. That the launches have or will carry commercial payloads means, ”the Chinese market is open enough toward private sector launch vehicles,” Lan stated. Landspace is now focusing on development of a liquid methane-liquid oxygen launcher named Zhuque-2 (Vermillion Bird-2) at a site in Huzhou in the eastern Chinese province of Zhejiang. 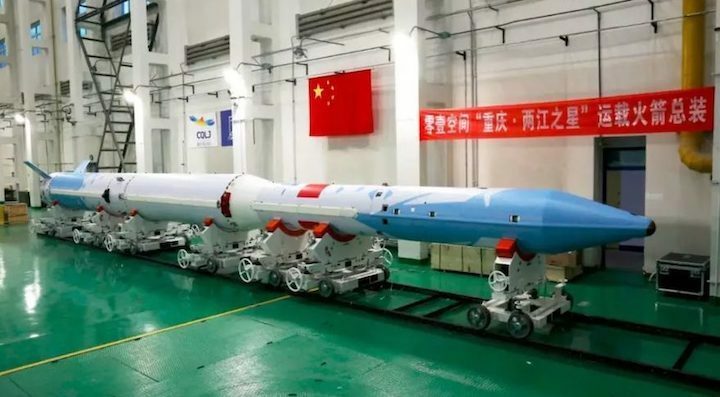 The two-stage Zhuque-2 will measure 48.8-meters tall with a diameter of 3.35 meters and be capable of delivering a 4,000-kilogram payload capacity to a 200-kilometer low Earth orbit and 2,000 kilograms to 500-kilometer SSO, using 80-ton and 10-ton methane engines. Landspace has in recent weeks announced that it had successfully carried out laser welding of the nozzle for the Tianque-12 80-ton-thrust engine as well as assembly of a turbopump for the engine.